Pro-choice? Nyahhh. Certainly not on taxes or recycling or diet or…… you name it. Just pro-abort, it seems. Why kill the child for the sins of the father? OBAMA discussing survivors of late-term abortion “that fetus, or child, however you want to describe it, is now outside of the mother’s womb“…. Obama was famously against providing any care for infants who survive late-term abortions, when he was a State Senator in Illinois. HERE is some of the coldest language I’ve ever heard. This alone disqualifies Obama from being President. Take note of the words referring to the unborn child who survives a late-term abortion, “…they’re not just coming out limp and dead….” He is completely for simply letting the infant languish and die, alone, in a utility sink or thrown in the garbage. It has taken some of these babies 8 hours to die, essentially being tortured to death for the crime of not being wanted. The fallacy in the anti-abortion argument lies in the shift from the scientifically accurate claim that the foetus is a living individual of the species Homo sapiens to the ethical claim that the foetus therefore has the same right to life as any other human being. Membership of the species Homo sapiens is not enough to confer a right to life. We can plausibly argue that we ought not to kill, against their will, self-aware beings who want to continue to live. We can see this as a violation of their autonomy, or a thwarting of their preferences. But why should a being’s potential to become rationally self-aware make it wrong to end its life before it has the capacity for rationality or self-awareness? The logical end of this type of thinking is that parents should be able to kill one month old babies (who have essentially no “rationality” or “self-awareness”). You may think that I’m exaggerating the case, and Singer doesn’t really intend that outcome. But you would be wrong. He is on record as saying exactly that. So: when someone is this morally, ethically deaf, should ANYTHING they say be given any credence whatsoever? Obviously not…. except that Singer is a hero of the Progressive Left, NARAL, Planned Parenthood, and by extension, whether you like it or not, the Democratic party, which supports these organizations. 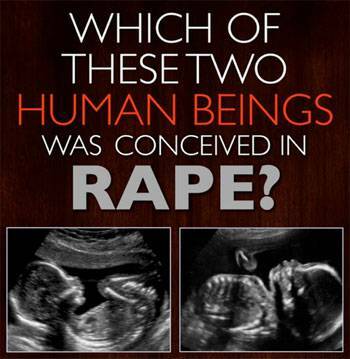 Abortion is a MORAL issue before it is a POLITICAL one…. but sadly, there are two many Christians who want to be more “politically open,” extending to supporting the Democratic party in furthering the murder of the unborn. It is truly the American Holocaust. One of the saddest aspects: the people in the USA who, of all people, should be most interested in protecting the helpless, because their forefathers were slaves, are in fact most likely to support candidates who favor making it easy for them to kill their unborn children. Of course, even by the distorted definition of “human being” above, President Obama wanted to withhold medical care from born human beings, when he was a State Senator in Illinois… because their mothers wanted them dead, and our president is so radical that he thinks mothers have a right to a dead baby when they abort, even if the child miraculously survives the abortion. Further, it seems our president didn’t even want these tiny human survivors to have “comfort care”…. because even that would involve acknowledging their status as human beings. Is it just me or is there something terribly wrong here? After an “outpouring of concern” a very large Maine lobster is going to be spared by a Cape Cod restaurant. Instead of becoming a feast it will be returned to the sea. Meanwhile approximately 3700 babies will be aborted today.